Equipockets are the delicious way to give your horse medication. They are tested at Equi-Analytical Laboratories and are under 10% ESC and Starch, which are the recommendations from veterinarians for horses with Insulin Resistance, Cushing’s disease, PSSM, and Equine Metabolic Syndrome. High in Omega 3’s and easily digested fiber. Delicious, soft, and easy to chew. Designed for any small tablet or capsule. Perfect for daily Pergolide or Prascend tablets! Our Equipocket pill pouch treats are so good, your horse will enjoy taking their medication! 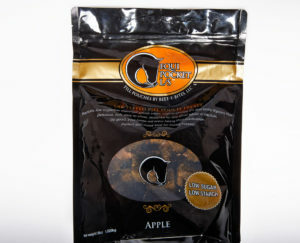 They are an ideal soft, moist treat for senior horses. Available in all natural flavors of Apple or Peppermint. 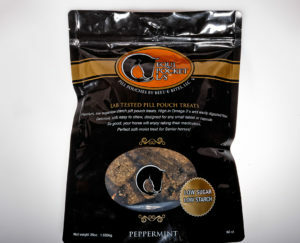 Equipocket pill pouch treats are excellent for horses that require a low sugar/low starch diet. Equipocket pill pouch treats do not require refrigeration, but can be refrigerated or frozen without affecting their yummy soft-moist texture. Best stored in a cool, dry place, out of sunlight. When purchasing multiple bags, extra bags can be placed in the freezer and thawed for later use. Feed pouch without pill for several days to get your horse accustomed to the treat before feeding with the pill inserted. For best results, offer your horse one pouch without pill, followed immediately by the pouch with pill inside. TO PURCHASE BEET-E-BITES TREATS CLICK HERE! Beet pulp (Non-GMO), Stabilized Organic Ground Flaxseed, Soybean Hulls, Organic Alfalfa Meal, Water, Natural Flavors, Organic Apple Pectin, Citric Acid, Cinnamon, Cold Pressed Soybean Oil, Potassium Sorbate.